Serene, compassionate, verbally expressive. These are but a few adjectives the persona of singer-songwriter India.Arie conjures. True to form, Arie was all of these things and more in an open letter she posted on Twitter (via Twitlonger because this is not your average 140-character pith from the social media) in couched but kind defense of Chrisette Michelle, who was roundly ridiculed for her decision to sing at a concert for the inauguration of a lying bigot (and then ridiculed some more when she attempted to explain her decision in aquamarine imprecision). 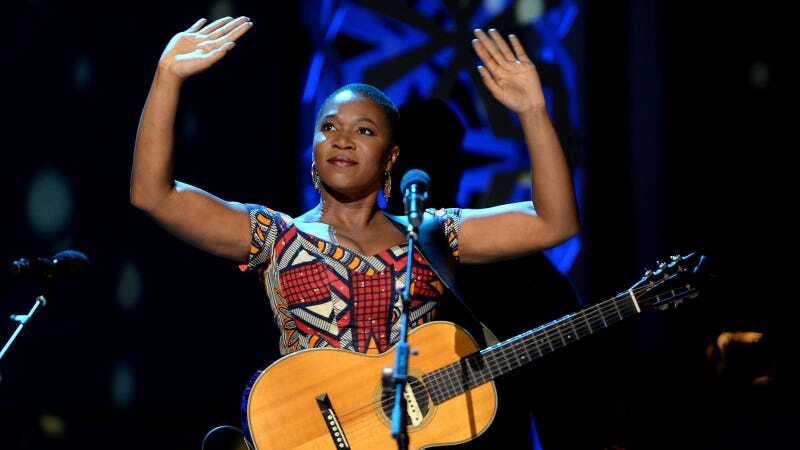 Would India.Arie have performed at the Trump show? No she would have NEVER done it. Do I agree with her performing at the inauguration? NO. I would have NEVER done it. For any price, under any circumstance. but thats ME. Do I think I understand the nuance that went into her decision? NO!! She recounts a conversation she had with fellow musician Anthony David, who told Arie he stands with Michelle. Though, Arie states, “This is a letter from US,” does she, like David, stand with Michelle? Well, that’s a no, too. Does Arie think Michelle’s decision to perform was a career misstep? Yes. Which is how I SEE this thing with Chrisette - a misstep. I think there is a deeper reason she decided to be there - and I think it was a career misstep. Does Arie think Michelle should not have been criticized at all? Nah. I’m not saying we shouldn’t say ANYTHING! I AM SAYING, LET LOOK AT HOW WE ARE SAYING WHAT WE SAY. Why the abuse? and the “Canceling Chrisette Michele in 2017?” and all of that? come on guys. Does Arie have a lot to say about the concept of wokeness? Oh yes she does. The culture is talking about being “WOKE” …. Woke from what? To ME, Woke, means conscious - making conscious decisions about how you navigate life. A basic spiritual philosophy is that, The highest consciousness understanding is that we are one interconnected humanity. So WAKE UP THEN! Agree or disagree with Chrisette , she is A HUMAN BEING - nuanced and multi dimensional. Not fluffy, pink, new age love. LOVE as in, THE RADICAL VIBRATION THAT IS LOVE! LOVE IN ACTION. Stop the petty talk - AND USE OUR ENERGY FOR THE HIGHEST GOOD. WE ARE MORE POWERFUL THAN WE KNOW when we are making “woke” or what I call, “high consciousness” choices. IF WE CAN JUST FOCUS OUR ATTENTION WHERE IT MATTERS, WE CAN AFFECT CHANGE. Right or wrong, India.Arie is decidedly India.Arie.